I still need to do a post on my Grand Rapids AQS Show adventures. That was going to be the subject of this post, but I changed my mind at the last minute. I thought taking a little time for some piecing might help cure my cold as well so....let me introduce Haunted Little Houses. 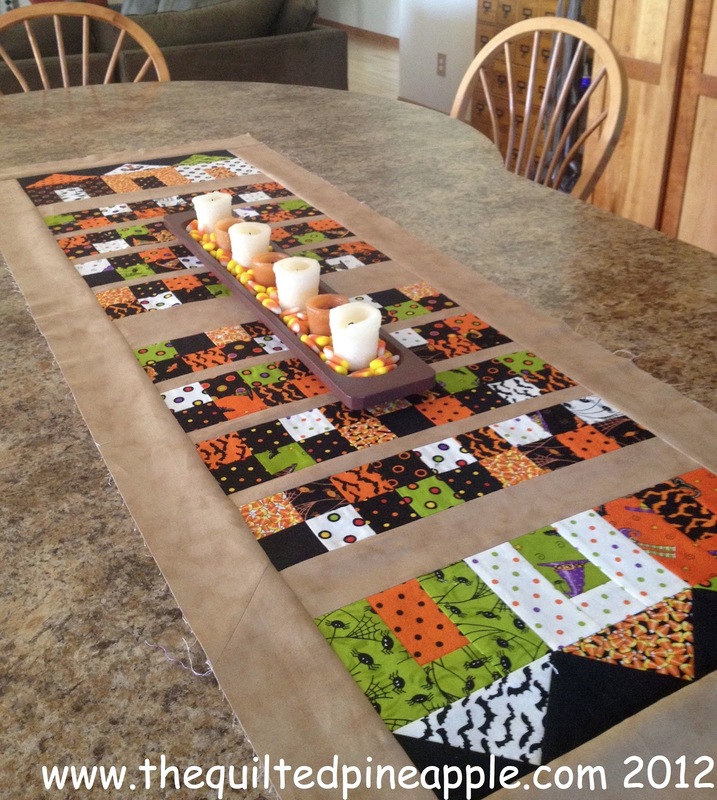 I changed up the pattern Full House Schnibbles by Carrie Nelson available here to make a cute fall/Halloween table runner!! It is a nice size. It measures about 19"x53". I think when I started out, it was not going to be that big. Well, you know me and super sizing Schnibbles...go big or go home is my motto!! :-) I love the size, though. Perfect for the kitchen island. 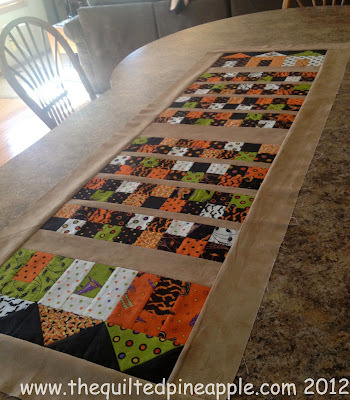 I used a couple of charm packs of Trick or Treat by Deb Strain for Moda and the sashing/border fabric is from Primitive Muslins by Primitive Gatherings for Moda available here. My all time favorite background fabric!! I am thinking once I quilt it, it will probably be getting a tan Rit Dye bath. Just to take the edge off the brightness of the fabric. I will post step-by-step directions if I do. I adore your haunted houses...too cute! And I love your Christmas runner....will still buy the magazine to see your creation...but it would certainly have made a nice cover! Thanks for a wonderful post! I have been wanting a new table runner for my house and I just love your runner, so I just bought this pattern. I have the perfect charm square pack to use with this! I am hopefully going to make it tomorrow. Mine will just be smaller than yours because my table is not as big! Thanks for the great post. Oh my gosh, that is so cute!! 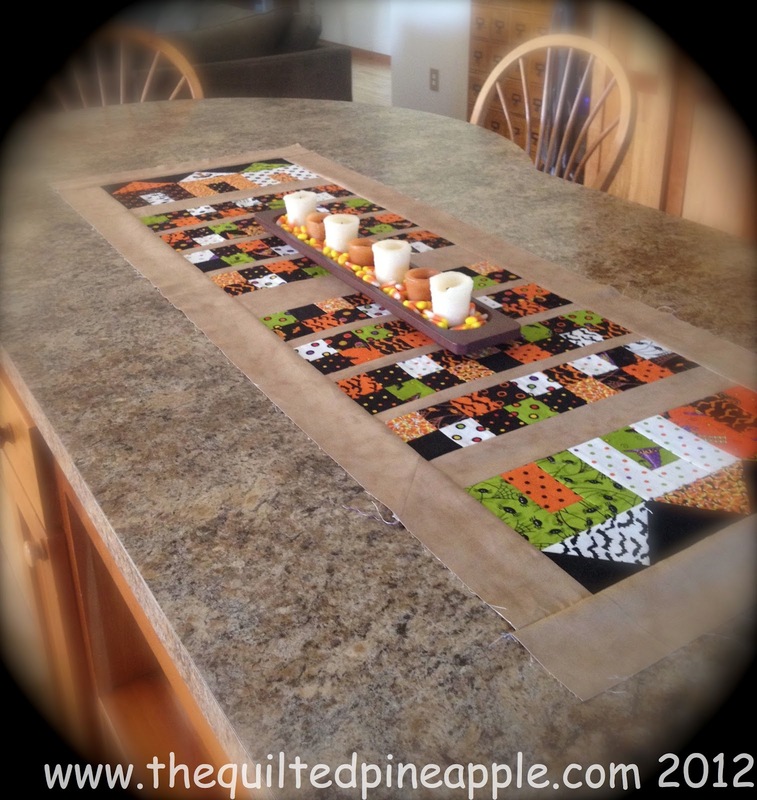 I made a square table topper using that same pattern and idea, and it was the funnest thing to make. I may have to make a runner too now :) Sorry your quilt didn't make the cover :( It is really great you have a quilt in a magazine though!! I hope you get to feeling better soon, a stay-cation sounds fabulous. Cool table runnner... and I love the idea of a tan Rit dye bath... what a difference that can make! Decorating for Fall and Halloween is such fun. 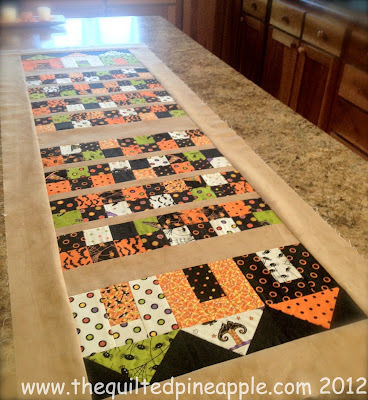 Your Haunted Little House Runner is really cute and is an inspiration to get busy sewing for the season. Your quilting and Lisa pattern SHOULD have made the cover! And that's the truth!!! Wonderful runner and table topper. I love your version of Carrie's pattern! Love those colors and it's hard to believe that autumn is quickly approaching. I sure wish you could have come with us to St. Lucia. That would have cured your cold for sure. IT really looks great! I love how you used the candy corn on your candle holder, too. So cute. I never would have thought to do that in Halloween prints. Just awesome. I love the runner , great fabrics and perfect for the season. I love Halloween quilts! And Halloween in general. Looking forward to seeing how you quilt it. How adorable! You are a wonder woman. So cute! I do love the candy corn...great idea...I have been absent from posting myself...life has just been crazy here...have a great evening!! Summer colds are very unwelcome for sure! Haunted Little Houses is adorable and a perfect decoration for a very fun holiday. I have no doubt you will be a cover girl soon. That is so adorable!! 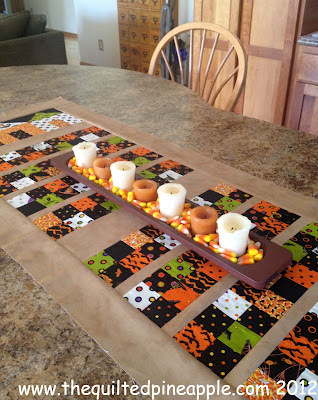 I love the candy corn filler- what a great idea. I'm sorry you are still sick. Rest and drink lots of fluids. What a darling little quilt! I hope you feel better soon, hon! Great idea for the house table runner!!! I might have to copy you! The haunted house runner would be an easy one to make. I love fall/Halloween style fabrics and quilts. Love it. What a pretty table using your table runner.